Establish a puppy feeding schedule for your Bichon Frise puppy as soon as you get your new dog home, and then stick with it. First of all, it’s important that your Bichon Frise puppy is at least 6 weeks old when you get her. Twelve weeks is even better. A puppy who is younger than 6 weeks is not ready to be weaned from its mother and her nutritious milk. Taking a puppy from its mother too soon, can cause stress for your puppy. 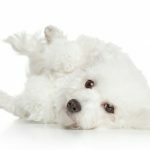 Bichon Frises are a sensitive dog breed, and being stressed can cause behavioral or health problems. feeding schedule is healthy for him. At the age of two months, the average Bichon Frise puppy eats one cup of dry food in a 24 hour period. Most pet parents do not give their dog the whole amount at once. Using a high quality kibble for puppies, give your puppy ¼ cup four times daily. The first serving should be in the morning after you’ve walked your dog. 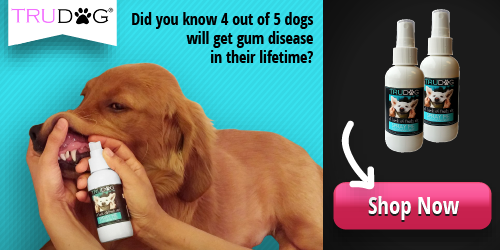 Follow at even intervals (lunch time, 3 pm, and 6 pm) allowing the dog to eat for about 10 minutes each time. It usually won’t take this long for your dog to finish her food. 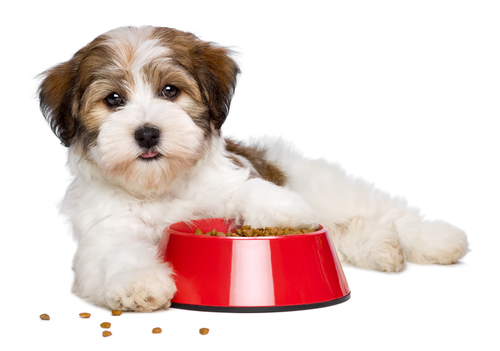 In addition, your puppy will need two dog bowls–one for food and one for water. Her water bowl should always have water in it, and your puppy should be able to take a drink whenever she is thirsty. 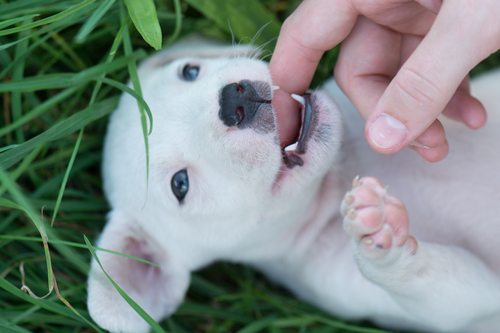 Around the age of 10 weeks your puppy should be ready for three meals a day. While the amount won’t change, you can adjust the timing so it better fits your family’s schedule. Following this pattern of having the last meal at the same time as your own will help your dog get through the night without needing to be walked. 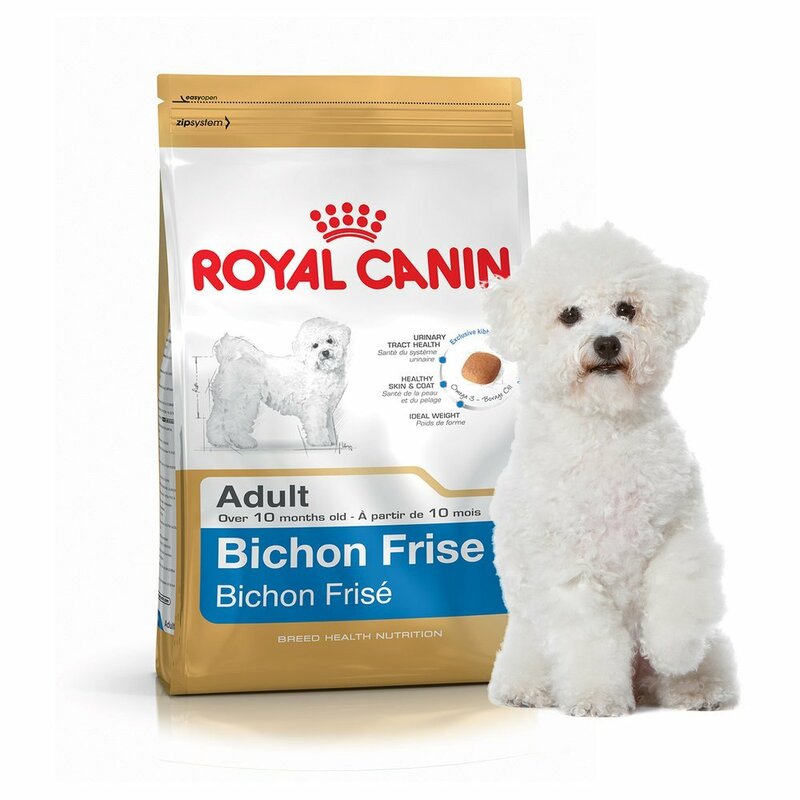 At six months of age, your Bichon Frise’s meals can be reduced to two a day – one half cup in the morning and one at dinner time. Bichon Frise puppies can be fussy eaters. 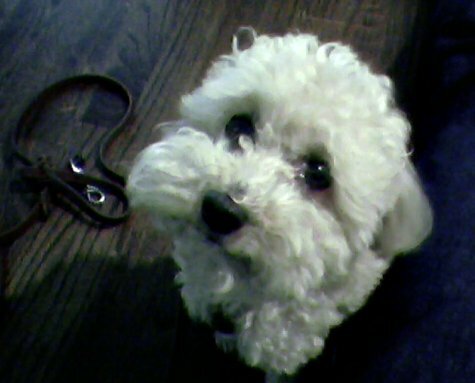 If you find that your Bichon Frise stubbornly refuses dry food, it’s OK to moisten her food with water. And using a kibble like one of these high quality puppy foods will help insure that your allergy sensitive Bichon Frise puppy will not develop allergies to her food. If you do need to change your dog’s diet, do it gradually over a week’s time. Changing your dog’s food too quickly can give her puppy diarrhea. By following these basic dog feeding guidelines, for the Bichon Frise puppy feeding schedule, you will be supporting your puppy’s health and giving him the best chance for a very long life with you. Remember to be consistent in feeding your Bichon puppy, and use good quality kibble for the best results. Bichon Frise puppy care is not really hard, and you will find it great fun to take care of your new little friend.